According to a recent article from the WV Record, an injured customer is suing a major big box retailer for an alleged slip-and-fall accident resulting in personal injury. This female plaintiff has alleged multiple negligence claims against defendant as being responsible for her slip-and-fall injury, which occurred in May of 2013 during a shopping trip to the store. In her complaint, plaintiff asserts she was in the pedestrian walkway of the store when the accident occurred. She further alleges defendant had breached its duty of care owed to her by allowing standing water to remain in the area designated for pedestrian traffic. Plaintiff alleges during the fall, she suffered significant injury to both knees, one ankle, her back and her neck. She also challenges defendant’s explicit claims that it maintains and safe and hazard free environment for all shoppers. Her specific claims include allegations of standard negligence, gross negligence, negligent misrepresentation pertaining to the claims of providing a safe, hazard free environment, pain and suffering, and negligent infliction of emotional distress. The plaintiff has also filed claims for pre-judgment interest, post-judgment interest, attorney’s fees and court costs. As our Boston slip and fall injury attorneys can explain, in the Commonwealth of Massachusetts, premises liability cases operate somewhat differently than they do in most other jurisdictions. In most jurisdictions, the courts adhere to a series of confusing common-law rules that distinguished the type of establishment or structure in which a plaintiff was injured and the person’s reasons for being at the scene of the accident. It can change the duty of care owed to a plaintiff if the plaintiff was a paying customer, season ticket holder at an arena or stadium, guest in someone’s home or even an “expected” trespasser. However, in the 1970s, the Supreme Judicial Court (SJC) for the Commonwealth of Massachusetts, which is our state supreme court, decided to do away with these old and no longer relevant distinctions and created a “bright line” rule concerning the standard of care for premises liability negligence cases. As long as plaintiff is someone who is expected to be at defendant’s home or place of business, and not an unforeseeable trespasser, defendant owes the same standard of care as in any other typical negligence case. In the Commonwealth of Massachusetts, it is first necessary to establish defendant owed a duty of care to plaintiff. While a duty of care can be created by statute (anyone with a driver’s license in a car crash case) or it can be created by a contractual relationship (a lifeguard with respect to a pool accident), not everyone has a duty of care to protect everyone else. However, a landowner does owe a duty of care to any foreseeable guests on his or her land. In other words, if a landowner has reason to believe someone will enter his or her land, he has a duty to act as a reasonable and prudent person to prevent foreseeable injury to that person and his or her personal property. 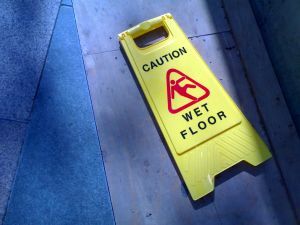 This can include making reasonable efforts to make sure the floor is dry at all times, and, when it is wet, placing warning signs telling customers to expect a wet floor.